Are you looking for aesthetics or functionality? Fountains are typically chosen for the aesthetic visual they provide whereas aerators are chosen for the functionality they offer. Aerators move large volumes of water to improve water quality. What size of pond or lake do you have? Getting an approximate measurement of your pond/lake size will help you determine what size of fountain or aerator to purchase. Measuring the length, width and depth of your lake/pond. What power do you have available at shoreline? Typically everyone has residential power but if you would like an aerator or fountain that is bigger you will need to speak to an electrician or an electrical contractor about power options at your site as well as the cost. What is your budget? Establish a realistic budget for your project. 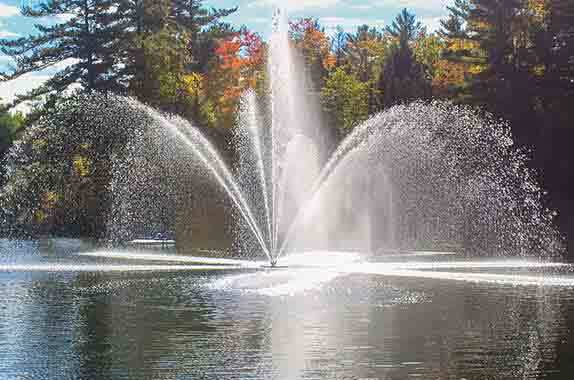 Our fountains /aerators are built to order and we quote each project individually. Does the company you are purchasing from have CSA/UL approvals on their products as a complete unit? Electrical safety is very important especially when putting a unit in water. We can assure you at Arbrux we have gone through rigorous third part testing to have all our models approved as a complete unit to CSA/UL standards by ETL.